Here I'll explain how to install the TechnoTrend/Hauppauge DVB card (a PCI card for both DVB data and DVB Television reception by satellite) for use with Europe Online (EON) and for watching satellite TV programs. Most Internet by satellite providers use a similar setting. Note: These cards are compatible with MultiDec - a piece of software capable of descrambling scrambled transmission like Pay-TV. Note: these instructions are Windows 9x based, other Windows version might work similar. This guide is good to start working with the combination of Europe Online and the Technotrend and look-a-like boards, like Siemens, Galaxis, TechnoTrend and Hauppauge DVB-s & Nexus, even in combination with SuperWeb ! The big downside of these cards, with the exception of Galaxis and Siemens, is that you should not count on any proper support from their helpdesk. Note: the entire setup is spread over several pages. This will increase the download speed for the page. In the text below I will refer to Hauppauge for drivers and software. For the Hauppauge look-a-likes similar software is available (all of them done by TechnoTrend) only the names are changed to for example TechnoTrend, Galaxis, etc. If needed, you can now connect the internal Audio connections. 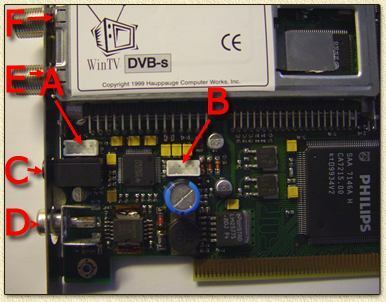 Your DVB card has 2 connectors for the internal audio connection. One of these (A - see image at Step 5) is connected to your souncard, the other connector (B - see image at Step 5) can be connectied - optionally - to your CDRom-player's audio output. This last option can be helpfull if you don't have enough connectors free on your Audio card. Alternatively, you can connect audio using the external Audio output of your DVB card. 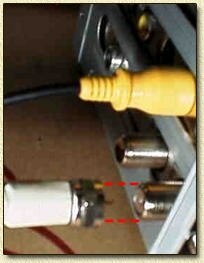 In the picture below marked as connector C (see image at Step 5). Use connector marked F in the picture below to connect your antenna to. The connector marked E can be used to connect additional satellite receivers (for example an other computer or a normal TV/Sat-receiver). Once again: NOTE THAT YOUR COMPUTER SHOULD NOT BE SWITHED ON! What ever you do: ALWAYS make sure your computer is switched OFF when connecting or disconnecting the antenna cable ! In the new dialog, check "Search for the best driver for you device" and select "Next". A new dialog opens. Insert the Hauppauge installation CDRom in the CDRom-drive. Check "Specify a location" and select "Browse...". Now start looking for the location of the drivers. The standard CDRom that came with the DVB-card, will show the driver in the directory CDROM:\Driver\7146 (ofcourse you will need to replace CDROM with the drive-letter of your CDRom-drive). You can also try to download a new driver version, see DVB-Drivers for details where to get these. Note: Windows 2000 and Windows XP user!!! You will NEED driver version 2.08 or newer !!! Select "OK" followed by "Next". Windows will display a message that it found your DVB card. Installation of the driver can be checked by clicking with the right mouse button on "My Computer" and selecting "Properties". Select the tab "Device Manager" and open the group "Sound, video and game controllers". There you will find the DVB card, the name is depending on the driver you installed, for example the Hauppauge drivers will indicate a "Hauppauge WinTV DVB-s". 2. click the "Start" button of Windows, select "Run..." and type the drive-letter of the CDRom-drive followed by ":\SETUP.EXE". For example D:\SETUP.EXE if D is the drive-letter of your CDRom-drive. A dialog appears, select "Next". The installation of the software will now be completed. When setup is finished copying files a dialog will appear in order to complete the network settings (not in Windows XP and Windows 2000). Automatically, while being at "network-installation", another dialog appears (Adapter Properties). Select "OK" - the virtual network driver is installed now - followed by "Exit and Restart". Windows will now reboot (not WinXP and 2K). Finally, after Windows finished rebooting, we can check the network settings of the DVB card. This is done by clicking "Network Neighbourhood" with the right mousebutton, and selecting "Properties". A "Network" dialog appears, where we see the "Virtual DVB/IP Network Adapter". Just beneath the Virtual Network Adapter we see the protocol used by the DVB-card: "TCP/IP -> Virtual DVB/IP Network Adapter" - double click this, so we can verify the IP-Address used. This is the way it should be: IP-address = 192.168.2.239. If this is correct, select "Cancel" twice. Network properties will now be closed. Just in case the IP-address is not correct, you can correct this. Note that in private networks, the IP-address might be in the same ip-range as the normal network. Make sure the network ip-range and subnet mask are not th same. Remember the IP-address, as we might need it later on ! In this particular step we will setup the transponders so we can actually receive data from the satellite. To make life a bit easier, I copied my registry settings so you can download these here. Settings for all transponders are included (103, 113, 114 and 115). After downloading, you will need to unzip the file using for example WinZip. Double click the unzipped file (make sure "DBV Data Services" is not running) and the information will be added to your registry. Note: this is a copy of the settings for the driver version 1.22. I don't know if they will work with other versions of the drivers ! If it worked can be cheked by looking at the "Service Selection" in the "DBV Data Services" application. Finding "EOL No103" there will be a good sign. Start the program "DVB Data Services" by selecting "Start" - "Hauppauge WinTV DVB-s" - "DVB Data Services". If the text appears in a different language, then use the little flag in the lower left corner to switch language. Now select the tab "State / Tuner" where you can select "New" to add a transponder. Here you will have to enter "Frequency", "Symbol rate" and "Polarization" as shown on the transponder page. As an example we will setup transponder 113. Select "Apply" and the indicators ("Signal quality" and "Signal level") will show a value now. The exact values aren't that important. The indicator in the SysTray will either display a green (dark or ligh) smiley if reception is OK. A red smiley indicates NO RECEPTION which can be caused by a typo or a badly adjust dish. Select the "Filter"-tab and add, in a similar fashion, the filters as shown on the transponder page. The Radius login, used by Europe Online, requires one additional setting: at the tab "Filter Options" you must check the "Calculate MAC address from the IP address of the dialup connection". The IP-address (0.0.0.0) is not very important, the application will changes this if needed. Repeat this entire "step" to setup all required transponders. When done, select "Hide". Note: "DVB Data Services" will always be required when internetting! On this page I will briefly describe how to get all the Radio and TV stations up and running for the DVB TV&Radio application without to much effort. Thank God this a relatively easy. You could have the program to search for the Radio and TV stations but there is an easier way to do this. I made my settings available for download so just about anybody can use it. The Astra settings can be download at either TechnoTrend or Hauppauge - See DVB Drivers for details. Click on the Windows "START" button. Select "PROGRAMS" - "HAUPPAUGE WINTV DVB-s" - "DVB TV & Radio". In the newer release (ie. 1.22) only the options "DVB Data Services" (for surfing the Internet) and "DVB TV & Radio" remain. In the "DVB TV & Radio" application, click on the silver colored binder to select the Astra settings file. The key combination CTRL+O will do the same job. If you downloaded the Astra aettings, you can now select the unzipped TPR-file and select "Open". All Radio and TV settings are now done. Not all stations will have image, for most of these channels you will have to get an subscription, like Canal+. Yep, there is a software descramble (CI/CAM) called MultiDec available that descrambles Pay-TV.